Choice for a healthy scalp and hair. 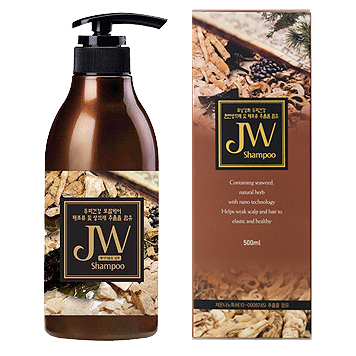 Because JW Shampoo contains seaweeds and 11 kinds of extracts of grains and medicinal herbs, etc, the product has excellence in a cleaning effect in scalp and hair and a heath effect on scalp and hair by providing nutrients for scalp and hair and by relieving the itching caused by excessive sebum and dandruff. The product is available for both men and women. After ensuring your hair is sufficiently wet, or an appropriate amount of shampoo into your hands to create plentiful foam. Rinse with water thoroughly to ensure the shampoo is washed out. Due to a menthol component contained in shampoo, the products provide cool refreshing sense. The product is available for both men and women. You have your scalp and hair soaked in tepid water, and then make them macerated for easy shampooing. After making light shampoo foam by adding 5 ~ 7ml of shampoo on the palm, apply gently on scalp and hair and rub evenly across regions of scalp on the scalp surface with the fingerprints parts of your fingers (for 30 seconds to 3 minutes). Lastly rise the entire hair by making bubbles. Don’t shampoo for more than five minutes. Daily shampooing is recommended. The hair and scalp is recommended to be sufficiently dried using a hair dryer or a cool breeze, When using the hot air, a distance of about 30cm is recommendable and combing in a wet state is not good. It is important to choose a shampoo that suits for your scalp condition. Especially, a shampoo containing less oil is recommend for seborrheic scalp (plenty of sebum or greasy). It is recommended that you need to have a habit of cleaning the sebum or contaminants by rubbing the surface of the scalp evenly and softly and then of cleaning hair. If you don’t rinse with enough water after use, this may cause hair loss or discoloration. Therefore, wash thoroughly with water after use. 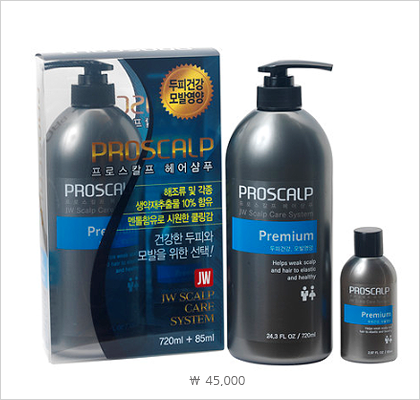 Proscalp Shampoo contains seaweeds and 11 kinds of extracts of grains and medicinal herbs, etc, those ingredients composing up to 10% of the total ingredients, the product has excellence in a cleaning effect in scalp and hair and a heath effect on scalp and hair by providing nutrients for scalp and hair and by relieving the itching caused by excessive sebum and dandruff. 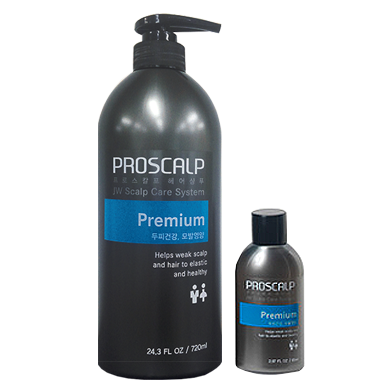 Because Proscalp Shampoo contains seaweeds and 11 kinds of extracts of grains and medicinal herbs etc, those ingredients composing up to 10 % of the total ingredients, the product has excellence in a cleaning effect in scalp and hair and a heath effect on scalp and hair by providing nutrients for scalp and hair and by relieving the itching caused by excessive sebum and dandruff.